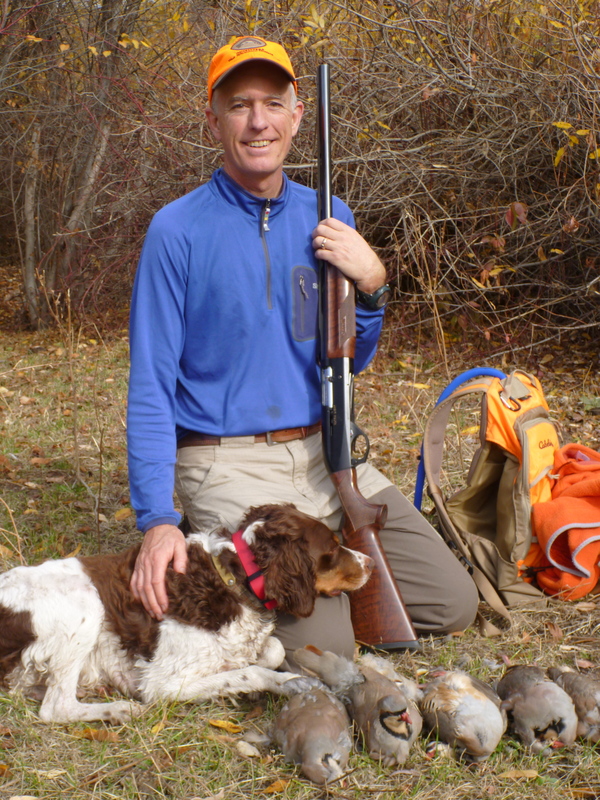 As I mentioned in an earlier post, when I moved up to Cambridge, I was excited about its proximity to the legendary chukar area called Brownlee. I’ve enjoyed exploring the new terrain in this area and have seen some pretty country. And I’ve been lucky enough to make it out in search of these birds nearly each weekend since the season started. I have not, however, yet found the bird numbers I’d anticipated. At the five or six spots I’ve humped significant ascents and traversed soreankle sidehills I haven’t succeeded at bagging more than a bird or two, and — in two cases — I’ve been skunked by the hill. Why? I’m not sure. I think it’s because I’m a slow learner, and I haven’t put in the hours (or seasons) to gain the local knowledge. What’s worked for me in the areas farther south that I know and understand hasn’t, so far, up here. One hunch I need to test is the elevation thing. The drill for the area I am familiar with is this: leave the truck and hike straight uphill for 30-60 minutes, gain a ridge, work from above, and without fail Angus points a covey pretty close to the top or soon after we summit. 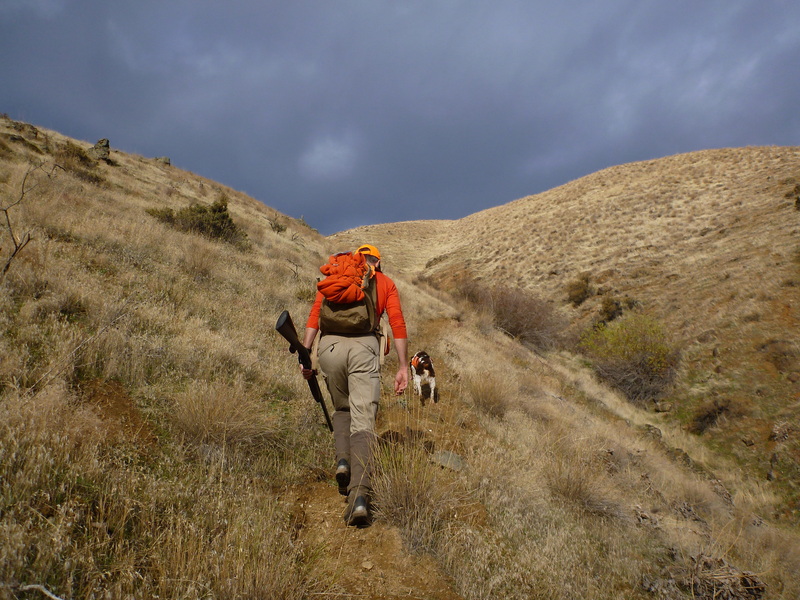 I began doing it this way after a couple early incidents in which I watched Angus point facing uphill, only to see the chukar easily evade us by running uphill, often over the ridge high above me. No shot. So I’d rather over-climb and then work down to keep that heart (and lung) breaking sight to a minimum. I’ve seen lots of birds this way, and assumed I could apply the same approach anywhere. Up north, though, I think that this high-low method hasn’t worked well for me because I’ve gone way too high. All the birds here that I have found (that Angus has found, rather) have been much lower on a hill than I’m used to seeing. So I’ve gotten some good exercise but probably passed so far above the birds that Angus can’t get anything fresh on them. They might not have been that high for days, if at all. This theory got some positive supporting data today. 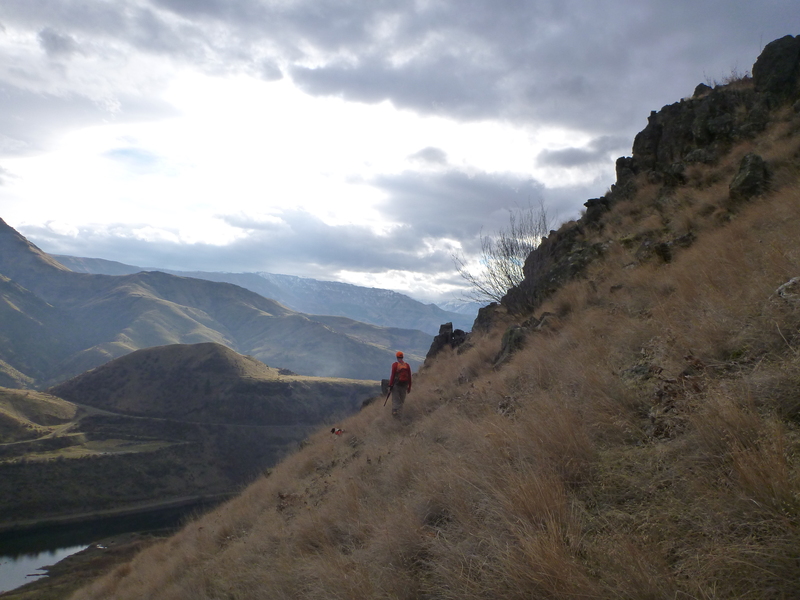 At 10:00 a.m. we hiked straight up to a ridge about 750 feet above the elevation of the truck parked along a river, and heard chukar below and to the west of us. I thought they were heading up the slope and thought — if we didn’t get into more birds up top — we might intercept those far-off chukar on our way back to the truck. Well, after a couple hours of tough hiking during which we saw no sign at all, even in good-looking habitat, I decided to try to find the covey we’d heard at the outset. I reached the high point of where I thought they were headed. No sign. Diagonaling back to the truck, and maybe 100 feet above the level of the road, Angus pointed about exactly where I figured we’d heard the birds calling earlier. Now noon, they hadn’t moved in two hours. Loads of fresh chukar poop littered the ground. Angus was locked. I knew the birds had to be there, and suddenly the first few lit. I managed to kill one and watched it fall while Angus had bounced to another point a few yards away. While reloading, of course, another dozen birds erupted from the bitterbrush and bunchgrass. And then another group. All nearly within range of the truck. Dammit. So maybe I’m learning something here. I’ll post an update at the next opportunity. I just want to thank you for taking the time to make these posts! I have been trying to pattern my bird hunting trips after your strategies and they have proven very successful. I still have not gone Chukar Hunting this season, but my pup has flushed many a quail and pheasant. I will probably make it to brownlee sometime in the next month if I can get a break from work. That is a very nice information you have Mr. Mcmicheal. I, myself, don’t have an interest in chukar hunting, but that is some very useful information you have. 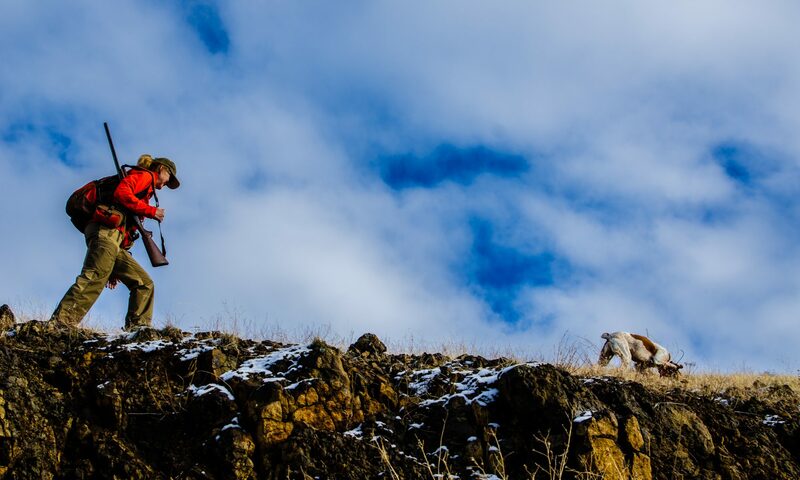 I think that it will really help future chukar hunters that are new to it.